Back in the glory days of local television, Boston’s WLVI-TV (Channel 56) ran a Saturday afternoon movie series titled “Creature Double Feature”. 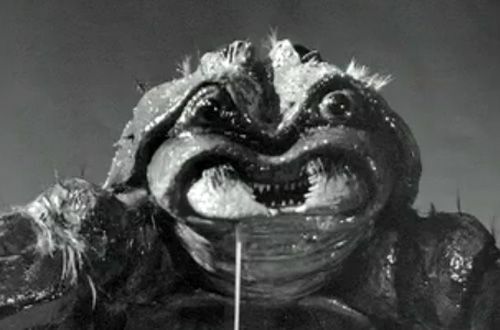 It was a huge ratings hit during the 1970’s, introducing young viewers to the BEM (bug-eyed monsters) movies of the past. 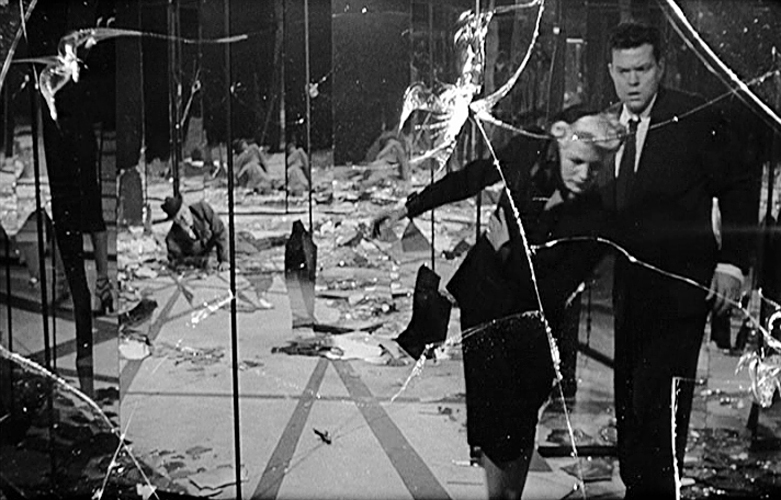 Let’s return now to those halcyon days of yesterday with a look at two sci-fi flicks from the fabulous 50’s. 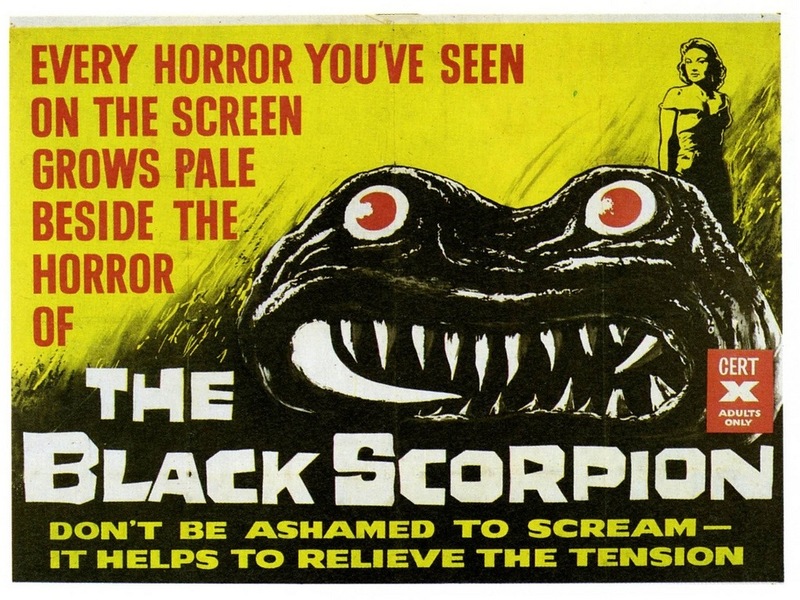 First up is THE BLACK SCORPION, a 1957 giant monster movie from Warner Brothers. This low-budget saga starts off with stock footage of volcanos erupting and earthquakes a-quaking, and a hyperbolic narrator expounding on natural disasters threatening Mexico. Two brawny geologists, Hank and Artur, investigate the devastation. While out scouting they run into beautiful rancher Teresa Alvarez, whose vaqueros have fled the hacienda in fear. After getting them back on the ranch, our scientists attend an autopsy of a dead Mexican cop (the doctor performing the autopsy looks like he should be starring in his own series of Mexican horror flicks!). The result is “organic poisoning”, and a giant footprint has been found at the scene of the crime. While scientist Hank and Teresa get cozy, scientist Artur has found a fossil with a live scorpion embedded inside (this particular scorpion squeaks like a mouse for no apparent reason). Teresa gets a call from the telephone lineman repairing the lines, and at this point they’re coincidentally attacked by a giant black scorpion! The scorpion attacks the village, causing the villagers to flee in panic (one of them exclaims “It’s a giant scorpion!”, just to make things clear). Experts led by Dr. Velasco believe the Giant Scorp was released by the recent upheavals (again, in case you weren’t sure). Hank and Artur , the Mexican Army (well, one truckload), and the vaqueros seek the Giant Scorps’ lair, and the two geologists are lowered by crane into a crevice, only to discover a whole host of Giant Scorps! A Giant Scorp grabs their cage, and they have to escape by being pulled up on the cable (including little Juanito, who stowed away with the scientists… and the less said about this obnoxious little brat the better!). Explosives are used to seal off the Giant Scorps, and the threat to humanity is over. Not quite- it seems another Giant Scorp found a way out, and is threatening Mexico City! This is the point where I lost interest in THE BLACK SCORPION, and will spare you the details. There’s far too much talking and standing around, and it’s 88 minute running time seems to go on forever. Despite having sci-fi stalwarts Richard Denning (CREATURE FROM THE BLACK LAGOON) and Mara Corday (TARANTULA) as stars, and fine special effects from Willis O’Brien (except when the filmmakers choose to use the Bert I. Gordon superimposition method in some scenes), the movie drags on and on, and is one of the lesser giant monster movies of the 50’s. One viewing of this turkey was more than enough for me, with only O’Brien’s special effects of interest. 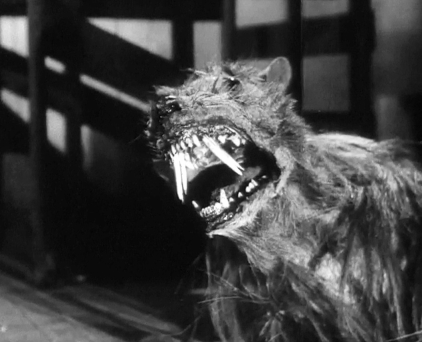 Next is THE KILLER SHREWS, and despite having an even lower budget, this film is far more enjoyable. Captain Thorne Sherman (James Best of THE DUKES OF HAZZARD) and his first mate Rook arrive at an island to drop off supplies. They’re greeted by Dr. Cragis (Baruch Lumet, father of director Sidney), his daughter Ann (Miss Sweden 1956 Ingrid Goude), assistant Dr. Baines (pirate radio king Gordon McLendon), Ann’s ex-fiancé Jerry (Ken Curtis, GUNSMOKE’s Festus), and servant Mario. A hurricane is brewing and Thorne and Rook are planning on spending the night, despite protests from the Cragis bunch. It seems they’ve been monkeying around with some sort of formula on shrews, little rat-like creatures who are basically eating machines. The experiments were designed to study the effects of overpopulation, or so they say. Drunken, irresponsible Jerry did something stupid, and now the island is overrun with vicious, insatiable Killer Shrews the size of dogs. And not those ratty little teacup pooches either, but dogs the size of German Shepherds! The Killer Shrews are actually dogs made up to look like monstrous shrews, with matted fur and long, sharp teeth! They’re pretty laughable, especially in close-up, when puppet headed Killer Shrews stand in for the dogs. The dark lighting and nighttime exterior shots almost but not quite help suspend belief, but the dog/shrews are just too ludicrous. Anyway, Rook gets attacked and killed, then Thorne and the gang are trapped in the house while 200-300 Killer Shrews try to dig their way inside. At least theoretically; there’s really only about six dogs/shrews made up for the movie, but 200-300 sounds far more ominous. Oh, and the Killer Shrews are rabid, to boot- one bite from their venomous fangs and its adios amigo! Yes it sounds incredibly cheezy, and it is, but THE KILLER SHREWS has a certain lunatic energy to it that makes it exciting to watch, unlike the dull BLACK SCORPION. Actors Curtis and McLendon produced this made-in-Dallas film simultaneously with another giant monster flick, THE GIANT GILA MONSTER. Both films were directed by Ray Kellogg, former special effects wizard at 20th Century-Fox. Kellogg also worked as second-unit director on many films, and co-directed the 1968 war drama THE GREEN BERETS with its star John Wayne. You mentioned my all-time favorite low budget horror flicks, “Creature From the Black Lagoon.” While the one or two sequels were just OK, the original was a masterpiece of that genre, at least in my overblown opinion. No fake miniatures or camera tricks, just great work from the guy who played the creature, and the costume designers. Have you reviewed that one yet? if not, would you consider adding it to your list? I plan on doing the Gill Man series for this October’s “Halloween Havoc” marathon… stay tuned! This is a good idea, if you enjoyed doing it I’d say make this a regular deal. 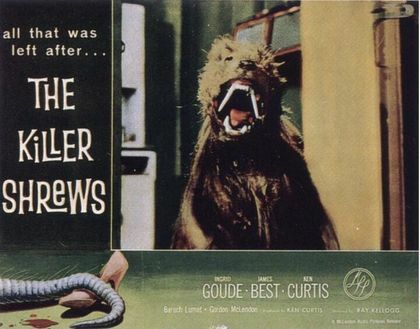 My wife always talks about the Saturday afternoon “Creature Features.” I don’t know if I’ve seen the first film, but TCM aired Shrews a few weeks ago and we watched it. To me, that’s one of those films that knowing a cast member makes a film watchable. Growing up on TBS’ constant airings of Andy Griffith and being a Twilight Zone fan, James Best kept my interest. Sounds like “Creature Double Feature” will return! Did you ever watch Creature Features broadcast from Chicago? I have to throw in my vote for more Creature Feature nostalgia, as well! I’ve never seen the first film reviewed here, but The Killer Shrews is an old family favorite. There will be more to come, G.B.! Next PostNext Happy Birthday America- You Rock!